We love seeing a fresh take on a traditional theme, so when we first spotted the nautical nursery that Amy Davidson and her husband designed for their son Lennox, we knew we just had to get the full scoop. 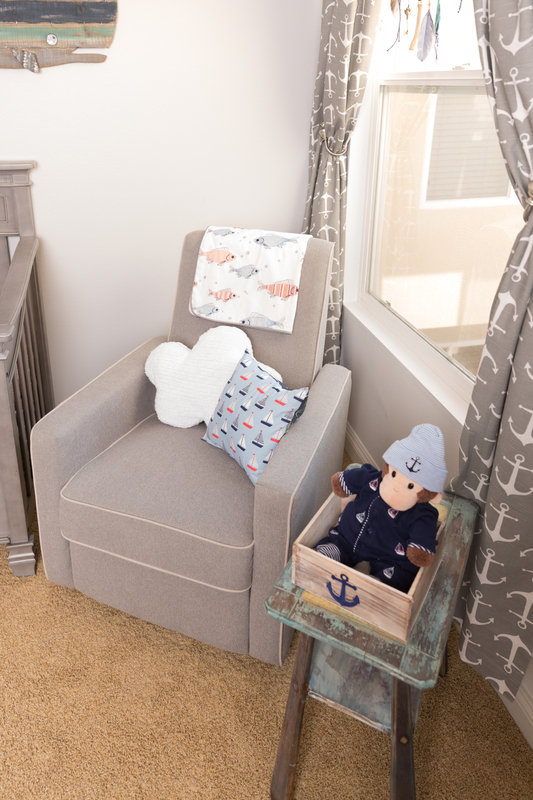 From the gorgeous nursery furniture from the évolur Cheyenne Collection, to the nostalgic, sentimental and unequivocally nautical touches throughout the room, the 8 Simple Rules actress infused the space with so much love. We’re so grateful to Amy for giving us a tour around Lennox’s room and sharing her nursery design story with us. Thanks Amy! Lennox’s room is filled with smooth textures and sharp lines. The sharp, clean lines of the évolur furniture are complemented by soft rugs and bedding. The Lorena Canals rug is amazing for babies because it’s machine washable, so I’m not afraid to use it for tummy time or to have him laying on it playing with his play gym. I think it’s important for a baby’s room to be baby-friendly. That’s why I chose this rug! Soft, comfy and washable. We have lots of magical touches in Lennox’s room, like my dad’s baby shoes that have been saved for all of these years, as well as the outfit that Lennox wore when he came home from the hospital. 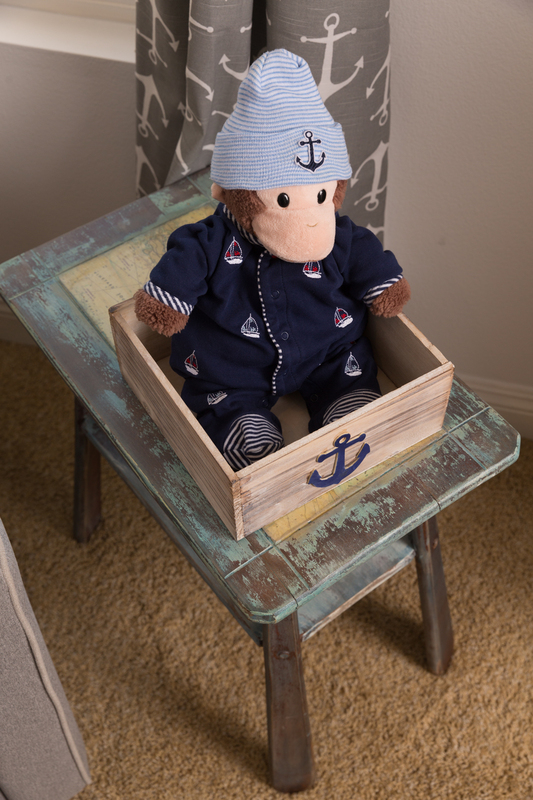 His monkey friend now wears his baby outfit and hat. They’re best buds. Because my husband is a boat captain, we loved the idea of a nautical theme. We added soft touches to complement the straight lines of the évolur furniture. I wanted soft fabrics with clean, straight lines—I love mixing textures. The design team at évolur totally understood the style I was going for, and they helped us complete the room with the anchor curtains and matching crib skirt. We then added a pop of red in the sheet and the adorable fishy blanket! My DaVinci glider was again one of the clean lines I was going for—it’s clean, simple and comfortable. It reclines, which was a must-have and saved me during those long nights of feeding! Now Lennox sleeps like a dream. I feel truly blessed that our little guy loves his room and LOVES his crib! He doesn’t scream when he wakes up in the morning, so I’ll watch him on the monitor and he just talks and coos and waits for me to get him up. The minute he sees me he has the BIGGEST smile on his face. Happy baby, happy parents! We’re enjoying parenthood. It ain’t easy, but it’s amazing! It’s All About the Boho, Baby!